Syros is a Cycladic island and the capital of the Cyclades prefecture and the South Aegean Region. Hermoupolis is the capital of Syros island. Syros flourished especially after 1826, when refugees from Psarra ans Chios settled on the island. Ever since that time, it has been a major naval, industrial and cultural centre of the newly established Greek state. 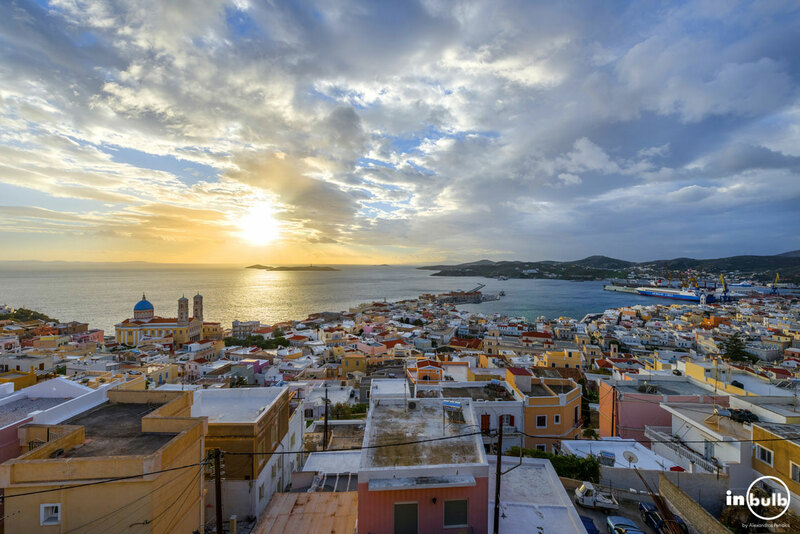 Syros has been inhabited since prehistoric times (3rd millennium BC), as evidenced by findings in the areas of Chalandriani and Kastri. In Chalandriani in particular, more than 600 tombs with grave goods were found, while in Kastri, a fortified settlement revealed major urban and commercial activity in the area. During the second millennium BC, the island has seemingly passed from Phoenician rule, to the Minoans of Crete, Mycenae and lastly, to the Ionians at the start of the first millennium BC. In Homer’s Odyssey, the island is referred to as “Syrii”, next to Delos island. In the heyday of the classical world, the island was of secondary importance, joining however the Athenian alliance. During the Byzantine era, the threat of piracy led to people deserting small and unprotected islands such as Syros. In 1204, the prevalence of the Venetians in the Aegean led to the creation of the first notable settlement of the island, Ano Syros, whose inhabitants converted to Catholicism. This situation was maintained until 1579 when Hayreddin Barbarossa conquered the island on behalf of the Ottoman empire. However, Sultan Murad III agreed with the rulers of Syros to grant a set of privileges (such as lower taxation and religious freedom) that would contribute significantly to the island’s future. In the outbreak of the Greek Revolution, Syros had a population of 4.000, mainly in the settlement of Ano Syros. But the destruction of Chios in 1822 and the persecution of the Greeks of Samos, Smyrna, Kydonies, Rhodes, Psarra and Kasos brought a massive refugee surge to Syros. 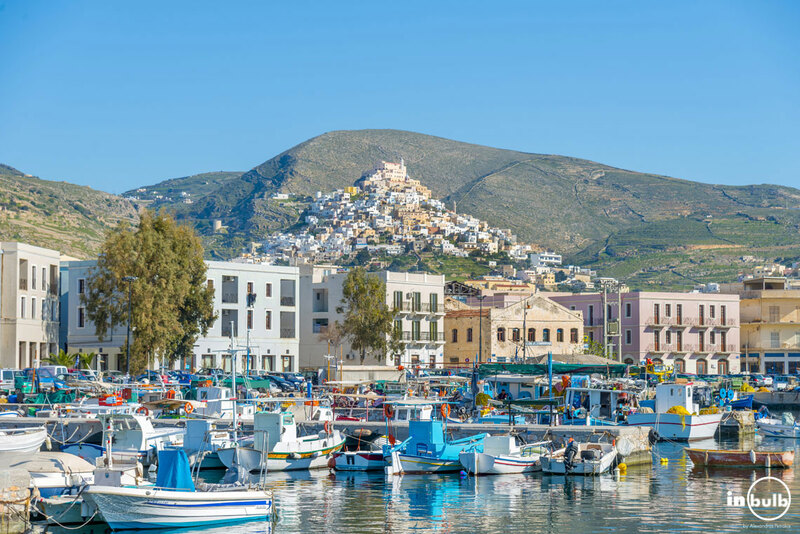 Refugees felt relatively safe in Syros thanks to the privileges granted to the island by the Ottoman empire and of course thanks to its natural environment, i.e. its large, protected port. This quickly led to an urban miracle at the foothills of Ano Syros. A vibrant town with rich buildings took shape in no time, taking the space of barren land and a few hovels and sheds. The population of Syros amounted to 14.000 inhabitants in 1828, making up the largest urban centre of Greece, while Hermoupolis rapidly became the largest industrial and commercial centre of liberated Greece, amounting to 20.000 inhabitants in 1850 and 22.000 in 1889, even more inhabitants than nowadays (approximately 15.000). Meanwhile, the affluent and educated people of Hermoupolis sought to give a unique cultural aura to their town, unprecedented by the standards of the time. 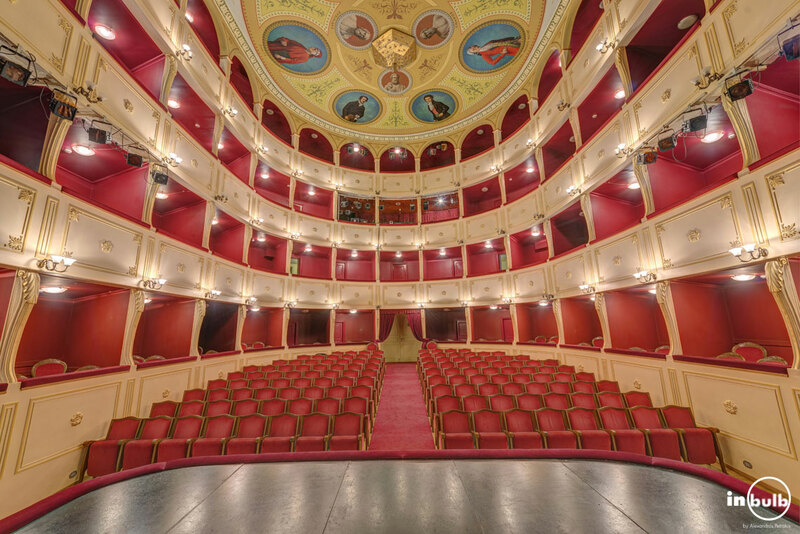 The historic 1st Gymnasium of Hermoupolis with Neofytos Vamvas as its first headmaster, was built thanks to contributions of the richest bourgeois and inaugurated in 1833, while the Apollon Theatre opened in 1864, hosting dozens of performances of Greek and foreign troupes every year. With the rise of the 20th century and the continuous development of Athens and Piraeus, a number of industrialists, merchants and bankers from Syros moved to the capital, shifting their centre of activities. The development of steam shipping made the port of Syros less important (sailboats used the port as a refueling stop) while the Corinth Canal changed the sea routes between north and south and also contributed to rendering the port less important. The most critical period as to the decline of Syros was the “Occupation” (WWII), when thousands of people from Syros died of hunger and hardships because of the island’s poor agricultural production and weakened trade. During the first post-occupation years, Hermoupolis and Syros relied on the limited agricultural production and the operation of shipyards, where vessels and other small boats were being built and maintained. The creation of the Syros shipyards, under the trading name “Neorio” with more than one thousand employees was of great help to the population which had been constantly dwindling since 1920 and was at its lowest numbers at the 1971 census. But after 1980, and especially after 1990, the island came into a new era of prosperity. Hermoupolis boasted an unexpected, mainly domestic, increased tourist traffic of high educational and economic level. It gained the fame of a living museum town thanks to its number of both private and public neoclassical buildings and squares, while the nearby small coastal villages of Galissas, Foinikas, Poseidonia, Vari, Kini etc. became also known. Nowadays, Syros seems to have a developed economy based on various sources: Tourism is a sector contributing decisively, Neorio shipyard (albeit with comparatively reduced staff), high agricultural production (mainly due to dozens of greenhouses), the presence of many public services (Syros consists of three municipalities while it is also the seat of the Prefecture of the Cyclades, the Region of the South Aegean, including the prefectures of the Cyclades and the Dodecanese, and the seat of the Court of Appeal of the Aegean) and the operation of the Department of Product and Systems Design Engineering – University of the Aegean.